Prezzo is a chain of Italian restaurants here in UK. Their menu has a range of starters, main's and desserts and it consists of pasta, pizza, spaghetti, risotto, salads and different meat and fish dishes. I have the Tastecard which offers 241 at certain restaurants if you show them the card. Prezzo accepts the Tastecard and they offer 241 on starters, main's and desserts. To begin with, we were greeted by the waitress and shown our table. She gave us the main menu and drinks menu. After looking through the starters we decided we would have main and dessert instead. I went ahead and ordered the Vesuvio classic pizza with chicken instead of pepperoni and with red chillis and sweet roquito peppers. My friend ordered the Funghi pizza and changed red onion, parsley and rocket for red chillis, roquito and mixed peppers. I would tell you guys the price but it varies as it all depends on the location. But as an example my pizza costs £10.99 and my friends cost £10.79, however as I had the Tastecard it only costs us £10.99 so around £5.50 each! BARGAIN EY?! My pizza was actually really nice, this was my first time at Prezzo and I wasn't sure what to expect. It was cooked to perfection and those sweet roquito peppers were full of flavour. The red chilli wasn't really 'hot' however, I did add some chilli flakes and a bit of chilli oil to spice it up. My friend commented on his pizza saying it was weird how the pizza was on a creamy mushroom base rather than a tomato base. However, it was nice and different and not something he would normally go for. He also added chilli flakes and chilli oil. The service at this restaurant was a bit of a hit and a miss. I asked the waitress for house dressing so I could dip my pizza crust in, she acknowledged this however 10 minutes later she still did not bring it, then I had to ask another waitress. They also took a lot of time to come and take the order and to provide us with the bill. It wasn't even busy therefore there really wasn't an excuse! Would I go back? Yes, of course I will! I really enjoyed the food and would happily go back, maybe to a different Prezzo though. The pizza was so filling that we ended up not ordering any dessert. Helps me I guess as I am trying to get a beach body for summer. 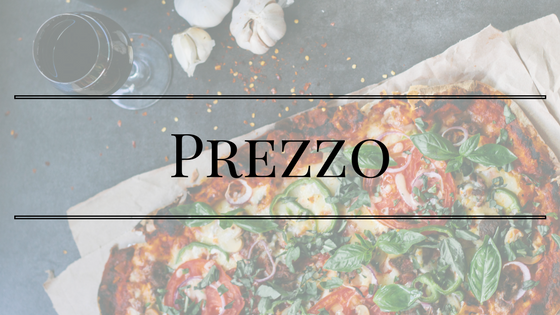 If any of you guys have been to Prezzo let me know what you think and what you would recommend for me to try next time.